Learning to play the Blues Box Guitar is easy and entertaining with accomplished musician Nick Bryant's simple instructions. 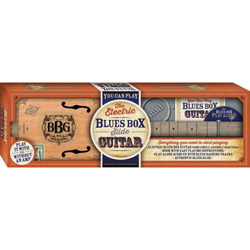 The instructional You Can Play Blues Box Slide Guitar book contains a history of the cigar box guitar; information about the Blues Box Guitar, including how to assemble and tune it; strumming, picking and slide techniques; and exercises that you can play along with to the tracks on the CD so you'll be strumming with ease in no time! Increase your blues-playing confidence with the comprehensive audio CD which contains companion tracks to all the exercises in the book, as well as a tuning track, blues scale, and a demo track played on the Blues Box Guitar with a backing band, which will inspire you to be the next Blues Box Guitar sensation! Use with, or without an amp.